On Thursday, September 16th, 2010, at the Plaza Hotel in New York, famed fashion designer b michael paid tribute to Haiti, by featuring garments and jewelry from that country at his “b michael America Spring 2011 Fashion Show”during New York’s Fashion Week. 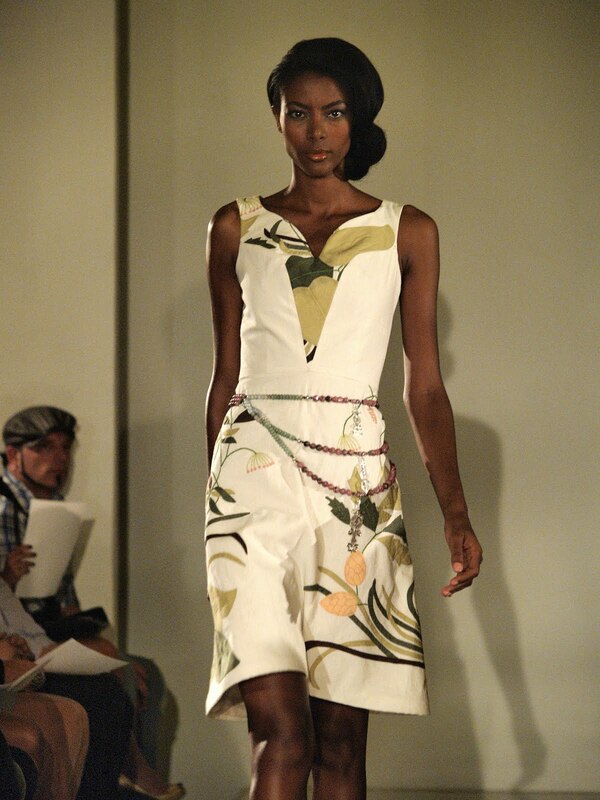 The designer introduced several fabulous and exciting garments made of hand embroidered Haitian cotton. Some of these pieces were worn by Ms. Haiti Universe 2010, Sarodj Bertin. On August 12th 2010, b michael & Mark-Anthony Edwards Vice President of Business Development & Media Relations for b michael America visited Port-Au-Prince/Fishing Village of Luly in Haiti, where they met with representatives of the Clinton Foundation and USAID-HAITI, to discuss heightening the creative resources and beauty of Haiti in contrast to all of it’s devastation. The inclusion of the Haitian products stems from these meetings. The “b michael America Spring 2011 Fashion Show,” was also used as an awareness event for the “The Dream Yard Action Project,” the largest arts education provider in Bronx, New York, reaching 8,500 from grades K-12. In support of b michael’s Spring 2011 collection the Legendary Actress Cicely Tyson was spotted sitting on the front row, New York First Lady Michelle Paige Paterson was also spotted on the Front row, Myrna Colley- Lee, BeBe Winans, Harriette Cole, Marcia Dyson, Nicole Murphy, Michaela Angela Davis and Dr. Joyce F. Brown, President of the Fashion Institute of Technology (FIT) were also spotted on the front row. The beauty look was modern glamour. The hair, created by Laura Ziba with Faces Salon, and the make – up was created by Michelle Virtue for Damone Roberts New York. Jewelry provided by Michele Frisch and several other Haitian Accessories Designers. Check out some of the looks from his collection below with photos by Ray Taylor.